The Bridge Size Clear Plastic Playing Card Boxes hold decks that are 2.25" wide by 3.5" high. 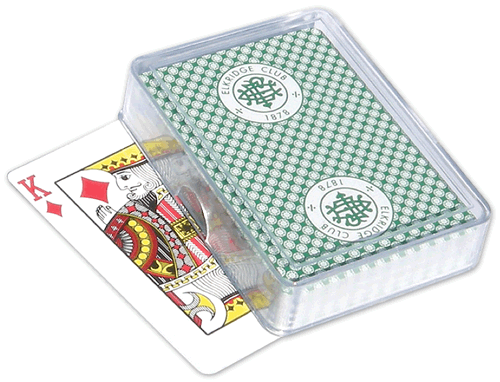 The Poker Size Clear Plastic Playing Card Boxes hold decks that are 2.5" wide by 3.5" high. The Single Deck Plastic Playing Card Boxes feature lift-lids with thumb notches (on the bottom of the sides), in which the lid goes down to the bottom of the card box to enclose the cards. The Double Deck Plastic Playing Card Boxes have lift lids that close 1/4" down on the bottom part of the card box, flush with the bottom piece of each box. For card boxes orders of 10,000 pieces or more, please contact us at 1-800-233-0828 for special pricing. 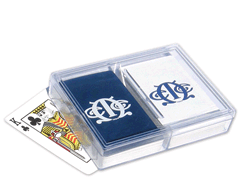 For additional information on our Acrylic Plastic Playing Cards Boxes, please contact us at 1-800-233-0828. You might also be interested in our Custom Playing Cards, Wooden Card Boxes, and Playing Card Supplies and Accessories.